Background Although widely recommended as an effective approach to quality improvement (QI), the Plan–Do–Study–Act (PDSA) cycle method can be challenging to use, and low fidelity of published accounts of the method has been reported. There is little evidence on the fidelity of PDSA cycles used by front-line teams, nor how to support and improve the method’s use. Data collected from 39 front-line improvement teams provided an opportunity to retrospectively investigate PDSA cycle use and how strategies were modified to help improve this over time. Methods The fidelity of 421 PDSA cycles was reviewed using a predefined framework and statistical analysis examined whether fidelity changed over three annual rounds of projects. The experiences of project teams and QI support staff were investigated through document analysis and interviews. Results Although modest, statistically significant improvements in PDSA fidelity occurred; however, overall fidelity remained low. Challenges to achieving greater fidelity reflected problems with understanding the PDSA methodology, intention to use and application in practice. These problems were exacerbated by assumptions made in the original QI training and support strategies: that PDSA was easy to understand; that teams would be motivated and willing to use PDSA; and that PDSA is easy to apply. QI strategies that evolved to overcome these challenges included project selection process, redesign of training, increased hands-on support and investment in training QI support staff. Conclusion This study identifies support strategies that may help improve PDSA cycle fidelity. It provides an approach to assess minimum standards of fidelity which can be replicated elsewhere. The findings suggest achieving high PDSA fidelity requires a gradual and negotiated process to explore different perspectives and encourage new ways of working. This study explores the PDSA cycle conduct of front-line healthcare improvement teams supported by the National Institute for Health Research (NIHR) Collaboration for Leadership in Applied Health Research and Care (CLAHRC) Northwest London (NWL) programme 2008–2013. It takes advantage of the documentation collated by the CLAHRC NWL programme to conduct a retrospective study. Specifically it aims to (1) assess the fidelity of a range of PDSA cycles documented in real time by front-line improvement teams; (2) determine whether any change in PDSA fidelity occurred over time; and (3) explore the strategies deployed by the programme team to support and improve the use of PDSA cycles. By retrospectively capturing the experience of the programme and project teams, we aim to provide insight into the reality of using the PDSA cycle method and providing support to teams to do so. The overall intention of the paper is to support future programmes and project teams in using the method effectively to improve patient care. 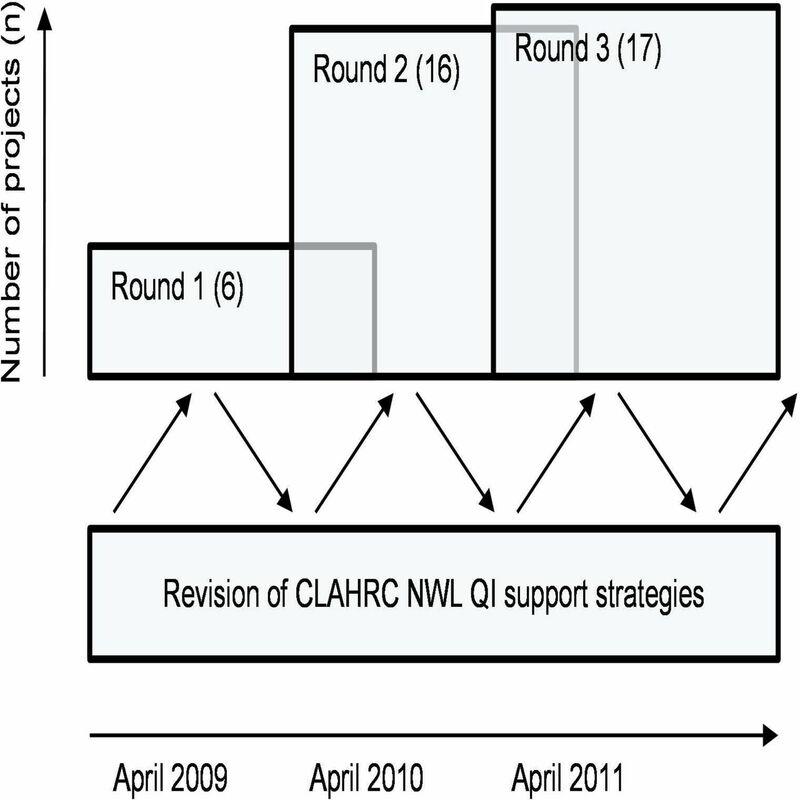 Between 2009 and 2012 the NIHR CLAHRC NWL programme supported 39 projects.9–12 Using a QI collaborative structure, a central programme team provided training and support to help front-line improvement teams use a suite of QI methods, including PDSA cycles, to improve the quality of healthcare through the implementation of research evidence into practice. The QI support team were made up of members of the programme and were from a range of backgrounds—clinical, managerial, information analysts and researchers. Each project team was assigned a main point of contact in the QI support team. The majority of the QI support team stayed the same throughout the programme, with one senior member moving on and being replaced after 2 years, and four additional junior posts starting in 2010. The support provided by the programme is referred to as ‘QI Support Strategies’. The projects were conducted over the three rounds of projects, each round lasting 18 months, with 6 starting in April 2009, 16 in 2010 and 17 in 2011 (figure 1).13 Project team members tended to be QI novices, with little or no prior QI experience. No entire team participated in more than one round, although a small number of individuals participated in different project teams over more than one round. The initiation of projects annually was purposeful so that teams overlapped and shared experiences, and so that modifications to the QI support strategies could be made based on feedback of both the programme and project teams. ’Round’ project initiation approach of National Institute for Health Research Collaboration for Leadership in Applied Health Research and Care (CLAHRC) for Northwest London (NWL). QI, quality improvement. Each project documented their use of PDSA cycles in real time on an online tool, the Web Improvement Support for Healthcare system.14 A total of 421 PDSA cycles were documented and are included in the study. Feedback from project teams about the use of PDSA cycles (and other QI methods) and QI support strategies was collated throughout the programme. This included project reports (n=96, including details of how QI methods were used); minutes from formal project review meetings (n=84, including discussion of project team perceptions of QI methods and QI support strategies, held at 6 monthly interviews); and teaching and support materials (including planning documents, slides and activity handouts). In total, 180 project documents were assessed (number of documents review per round: R1=11, R2=80, R3=89) and training materials from 20 events teaching or referring to PDSA cycles. In addition, to triangulate data derived from the document analysis, interviews were conducted retrospectively after all three rounds of projects had been completed. Three programme team members who had been involved in teaching and support of PDSA across all three rounds of the programme were interviewed. The data from the interviews were intended primarily to clarify and explain our findings. What was the fidelity of conduct of all PDSA cycles against the core principles of the method? Two reviewers (CM and LL) first coded a third of the 421 cycles against the principles in Microsoft Excel. Before coding, they were familiar with and had discussed the principles outlined in Taylor et al’s3 systematic review of PDSA cycles (of which CM was an author). They also reviewed a small number of PDSA cycles together to learn how to apply the framework. Both reviewers had completed QI training on a range of methods, including PDSA cycles. The reviewers were blinded from the project name and round, and while they may have delivered training for the teams they were not involved in the delivery of the projects. Intercoder reliability, as indicated by Cohen’s kappa, ranged between 1 and 0.77, with percentage agreement between 100% and 82%. Discrepancies were resolved by discussion and consensus and a shared understanding was developed. The remainder of the cycles were then coded by one reviewer (CM). How did PDSA cycle fidelity change over time? What QI support strategies were used by the programme and how did these change over time? The experiences of project teams and QI support strategies used by the QI support team were explored through document and interview analysis. Project reviews and training materials were initially reviewed to identify high-level themes relating to PDSA cycle conduct and QI support strategies. These themes informed the interview questions with QI support team members. Selected training materials were brought to interviews to act as prompts. Drawing on both documentation and interview transcripts, a full thematic inductive analysis using the constant comparative method was undertaken to identify themes relating to the QI support strategies used and the experiences of both the QI teams and QI support team. Detailed open-coding of themes within text were identified along with code definitions. These were grouped to high-level categories before further conceptualisation within each category. Coders met to discuss and refine coding in an iterative manner. All data (documentation and interview transcripts) were also coded to project round(s) that they related to. Themes were discussed with other authors and other members of the QI support team to support sense-making of the analysis in light of the historical development and conduct of the programme, and to discuss and clarify gaps in analysis. Full roles of the authors in the data analysis are presented in online supplementary appendix 1. A total of 421 PDSA cycles were documented and included in the study. 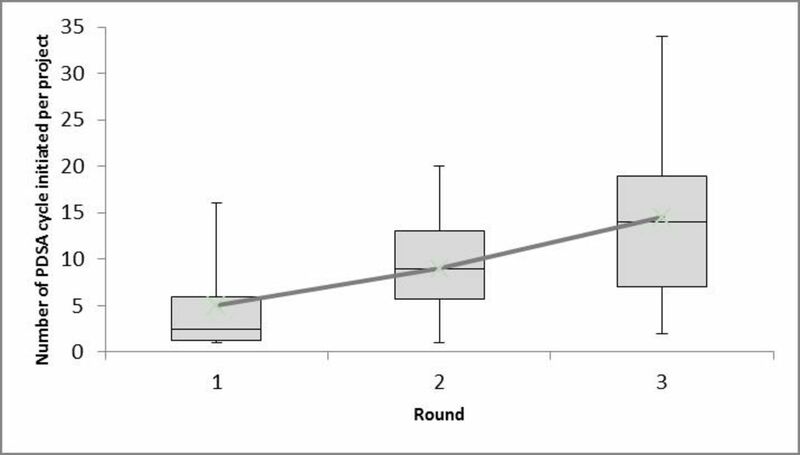 There was a statistically significant increase in the mean number of PDSA cycles initiated by project teams across the three rounds (figure 2) (p<0.05) (online supplementary appendix 1 provides further details on the analyses). Box and whisker diagram of the number of Plan–Do–Study–Act (PDSA) cycles per project across the three rounds. Over the period of study, 2% (7/421) of PDSA cycles reviewed adhered to all six measures of fidelity, 12% (49/421) adhered to >5 principles and 29% (121/421) adhered to >4 principles as described in the framework. Table 2 presents individual results by each measure of fidelity. Only PDSAs with full documentation were included in full fidelity analysis (299), the rest (122) being excluded from further analysis. Improvements in fidelity were observed across project rounds for all PDSA cycle principles, except for the presence of a learning activity within PDSA cycles which was high (above 98% of cycles) across all three rounds (table 2). These improvements were statistically significant for documentation (all PDSA cycle stages documented, p<0.001, moderate improvement 50%–77%; ‘Study’ documented in past tense, p<0.001, moderate improvement 67%–92%), predictions (explicit prediction documented, p=0.001, modest improvement 0%–18%) and iterative cycles (PDSA cycle within iterative series of cycles, p<0.001, substantial improvement 0%–60%). Improvements were seen for incremental scale and use of regular data over time, but these findings were not statistically significant. The seven cycles adhering to all indicators of fidelity were all from final round projects. Online supplementary appendix 2 presents the full statistical results. What QI support strategies were used by the programme and what were their experiences of introducing PDSA to QI novice teams? Overall, thematic analysis of all data identified three areas of challenge for project teams using PDSA: intention to use, understanding of how to use and the application in practice. They were evident through three corresponding assumptions, described by interviewees, in designing the original QI support strategies: a belief that people would be motivated and willing to use PDSA, that PDSA was easy to understand, and that PDSA was easy to apply in practice. By assuming that PDSA was easy and that project teams would be receptive to its use, the original QI support strategies failed to address the challenges encountered, particularly in the first round of the projects. The QI support strategies in round 1 (table 3) were felt to have exacerbated these issues and were seen as a contributing reason for low levels of understanding and intention resulting in the low levels of PDSA use and PDSA fidelity identified in the quantitative analysis for round 1. As the QI support team gained experience and expertise, they recognised that the introduction of PDSA methodology required a fundamental change to how project team members thought about and approached change. This was clearly observed as changes in the reviewed training materials. Interviewees reported that, in light of the observations and the learning gained by the QI support team, deliberate actions were taken to improve the support for PDSA cycle conduct. Table 3 provides details on the original and revised QI strategies, and their reported consequence. Online supplementary appendix 3 provides additional supporting quotes. A lack of intention to use the method was reflected in instances of low levels of use and fidelity of PDSA cycle. Qualitative analysis suggested this was influenced by the team’s beliefs and plans on how to tackle change and improvement, as well as their understanding of why the method could be helpful. Some teams had predefined intentions on how to conduct their projects, and clinical academic project team members were also reported to have raised concerns about the iterative nature and small sample sizes that PDSA cycles used. There was also a reported perception that the use of PDSA cycles was for the benefit of the QI support team rather than adding value to the project team itself. Areas such as documentation and data collection were seen as a form of programme assurance, rather than as mechanism to help the team learn, and therefore inhibited motivation. To manage expectations in relation to the use of QI methods, rounds 2 and 3 were required to attend introductory workshops prior to applying for funding and support, and the application process required them to demonstrate their intention to use and initial understanding of QI methods. Changes to training sessions were also made which reflected a recognition that the effective use of PDSA required more than just technical knowledge, but a willingness and motivation to use the method and to change previous ways of working. Time was also invested for QI support staff to facilitate debate and critical thinking in regard to the method’s use. These discussions were seen as important for project teams to cognitively engage with the PDSA method and position its use within their prior experience and knowledge. Understanding referred to the capability to use the methods and included knowledge of the concept and also the specific principles of the PDSA method. Understanding and intention were distinct factors but interlinked: some teams may have had little intention to use the method as they did not understand it; some may have understood the method and consciously intended not to use it; and some may have intended to use but had insufficient understanding to use with high fidelity. In some cases, project team members were observed to embrace the PDSA method as an alternative way of working that empowered them to make rapid changes in their local settings. In these cases, however, there was a tendency to ‘PDSA everything’ with little critical consideration of whether the method was being applied well, nor in following the premise of iterative development of a change over time. As outlined in table 3, original teaching was frontloaded at the beginning of the programme and delivered by external QI experts. Analysis of teaching materials from rounds 2 and 3 demonstrated a different approach that staggered teaching of the method over time, delivered by the QI support team. Initial training sessions focused on the rationale of using the method, and over time evolved to conducting a single PDSA well, before considering iterative chains of PDSA and use of data over time. Training sessions were also designed to include more relevant examples of PDSA cycle use, and individuals with past experience in projects were invited to present them. These examples were perceived to be of greater relevance to the new project team members, and less ‘push back’ was experienced. Application of use referred to the way teams went about using the method in practice. It included social challenges, such as bringing a team together to discuss a PDSA, or technical challenges such as the difficulties collecting and analysing data. It was interlinked with the other factors as true understanding could only be achieved through experience of application in practice and the appreciation that the method may be simple in theory but hard to apply in practice. Project team members were expected to work together to design, conduct and review PDSAs with the intention of all members sharing their professional perspectives. However, this was reported to rarely occur, and the use of PDSA was often delegated to an individual team member. Practical time constraints or competing priorities also presented challenges to completing PDSA in real time and with high fidelity. The method was often used retrospectively to frame past actions rather than prospectively plan and test changes iteratively. This meant that principles such as use of predictions or consideration of scale were not applied. In recognition of these challenges, the role of QI support team shifted from an arm’s length advisory role to working much more closely with the project teams. This included greater presence of QI support staff within projects to facilitate structured discussion about how changes should be tested and role-model the use of PDSAs. Teams were also supported to develop aims and measure definitions earlier so that timely data were available to inform PDSA cycles.18 Additionally, the programme invested in providing greater support and training to the QI support team members themselves. Over a three-and-a-half-year study period, moderate yet significant improvements were seen in the number of PDSA cycles conducted and the fidelity of these cycles against the key principles of the method. However, across the total sample of projects, PDSA cycle fidelity remained low with key principles of the method frequently not met. The study presents a theoretical framing and practical solutions to support better use of the PDSA method. It suggest that project teams’ intention, understanding and application of the PDSA cycle method are three areas in which QI support teams should consider when supporting the method’s use. The actions taken by the QI support team to revise the QI support strategies align with improvements in fidelity of PDSA cycles. Given some limitations of the retrospective nature of this work, findings about the relationship between changes in QI support strategies and improvements in PDSA fidelity are intended to be exploratory (hypothesis-generating) rather than indicative of causality (hypothesis-confirming). The programmed yearly project initiation cycle allowed an iterative approach to be taken by the QI support team to respond to challenges faced and revise QI support strategies over time. The QI support strategies were revised in the recognition that developing intention to use PDSA, understanding of how to use it and mastery of its application in practice are a gradual and negotiated process. Of note, the measures of fidelity that did not see significant improvements were those requiring users to revisit the method, including the increasing scale and use of data over time. Even with an adequate level of intention and understanding, these principles are arguably more complex and harder to achieve as they require skills and behaviours to work effectively as a multidisciplinary team to make decisions and plan between cycles, as well as the application of ‘measurement for improvement’ principles. In establishing a rationale for the changes in fidelity over time, we also considered other changing contextual factors. Over the study period, the majority of the QI support team stayed with the programme and were likely to have gained in skills and competencies over this time. A small number of project team members also moved between teams over rounds. This could provide an alternative explanation as individuals increase experience and understanding of how to use PDSA over time, although perceptions from the QI support staff indicated that disengagement and misunderstanding of the method were equally likely to persist over rounds for some individuals. The authors are not aware of any other major contextual influences that happened during the study period. The extent of these or other contextual influences remains to be tested in future research. This study reinforces growing research that emphasises that the use of QI methods is not simple. The use of QI methods must be considered as complex sociocultural interventions that require significant technical and social skills. This understanding needs to inform future use and the design of QI support strategies and PDSA education. Previous studies have identified the challenges of adopting new methods into existing organisational cultures and practices,19 20 31–33 and that to use QI methods well requires people to adopt fundamentally different ways of working.31 32 Introducing QI approaches into new settings needs to be carefully designed and delivered to consider how to support the introduction of behaviours that are often counter to prevailing organisational norms. The idea of conducting pragmatic and scientific tests of change locally to ensure that interventions were fit for purpose in a particular setting occupies a middle ground between the rigour of traditional academic research and the pace of change in healthcare organisations. While PDSA has the potential to bridge between these two worlds, it also presents a very different way of working which was not readily accepted or implemented by teams using the method. This is the first study to provide a detailed assessment of a large number and range of PDSA cycles documented in real time during an improvement project. The fidelity assessment framework presented in this paper could be used in the future to provide a formative assessment of PDSA fidelity and provision of real-time feedback to project teams. This can support teams to identify and respond to factors within their local context and improve PDSA cycle conduct. While this research would ideally have been conducted prospectively, the challenge of PDSA use and how to improve it only drew the attention of programme leaders, and researchers, as the work progressed.34 A resulting limitation is that interviews were only conducted with the three QI support staff who had been present and involved in teaching across the different project rounds and were still working with the programme at the time of the study. To counter this challenge, common themes were drawn from triangulating data from project team reports and review meeting minutes, training material and QI support staff interviews to ensure findings were reflective of the project team’s perspectives as well as the QI support team. The theories and strategies proposed in this paper require further investigation and, in particular, prospective application to assess if improvements in fidelity can reliably be achieved in practice. Additionally, a limitation is that the study was reliant of PDSA cycles documented by front-line teams. While this provides a greater depth of insight to published reports of PDSA,3 it provides only a partial and selective reflection of how PDSAs were used in practice. Further research is needed to observe actual PDSA conduct in practice and to understand the perspective of front-line QI teams. This study demonstrates that PDSA fidelity can improve over time and identifies revisions made to QI support strategies intended to influence the intention and motivation of project teams to use PDSA, and their understanding and application of the method in practice. The study reinforces the literature that suggests engagement and fidelity in using QI methods are challenging, and that QI methods should be considered as complex sociocultural interventions that also require significant technical skill. The work suggests that QI support strategies can be designed to support increased PDSA use and fidelity, but that achieving this is a gradual and negotiated process requiring sufficient time and support to explore different perspectives and encourage new ways of working.
. High Reliability and ‘Cargo Cult QI’: response to Sutcliffe, et al. BMJ Qual Saf 2017;26:248–51.
. Quality improvement: science and action. Circulation 2009;119:1962–74.
. Simple Rules for evidence translation in complex systems: a qualitative study. BMC Med 2018;16.
. Patient and public involvement in healthcare quality improvement: how organizations can help patients and professionals to collaborate. Public Management Review 2015;17:17–34. , 2013. Research projects 2009-2013. Available: http://www.clahrc-northwestlondon.nihr.ac.uk/research-projects [Accessed 12 Nov 2014].
. Model-driven approach to data collection and reporting for quality improvement. J Biomed Inform. , 2004. Content analysis: an introduction to its methodology. SAGE. Available: http://books.google.co.uk/books/about/Content_Analysis.html?id=q657o3M3C8cC&pgis=1 [Accessed 31 Jan 2015]. , 1990. Basic content analysis, Issue 49, SAGE publications. Available: http://books.google.co.uk/books/about/Basic_content_analysis.html?id=iv1oAAAAIAAJ&pgis=1 [Accessed 31 Jan 2015].
. Statistics for managers using Microsoft Excel. Prentice Hall, 1999.
. Designing quality improvement initiatives: the action effect method, a structured approach to identifying and articulating programme theory. BMJ Qual Saf 2014;23:1040–8.
. Report on the ‘Breakthrough’ Collaborative approach to quality and service improvement within four regions of the NHS. A research based investigation of the Orthopaedic Services Collaborative within the Eastern, South & West, South East and Trent regions. Birmingham, 2002.
, 2016. The problem with root cause analysis. BMJ Qual. Available: http://qualitysafety.bmj.com/content/early/2016/06/23/bmjqs-2016-005511.short [Accessed 20 Apr 2017].
. A framework for collaborative improvement: lessons from the Institute for healthcare improvement's breakthrough series. Qual Manag Health Care 1998;6:1–13.
. Training healthcare professionals in quality improvement. Futur Hosp J 2016;3:207–10.
. Healthcare professionals’ views on clinician engagement in quality improvement. London, 2006.
. Ten challenges in improving quality in healthcare: lessons from the Health Foundation’s programme evaluations and relevant literature. BMJ Qual Saf. Contributors CM and LL collected the data, interviewed participants and carried out the analysis. While employed by NIHR CLAHRC NWL, they joined later in the programme and had no involvement in supporting or provision of training to project teams. TW supported PDSA cycle data extraction and quantitative analyses. JER and DB provided academic oversight and support to the study and review of analysis. JER and DB were involved in the development of the QI support strategies, teaching of PDSA and overall programme oversight, but not day-to-day project support. All researchers contributed to reflections and sense-making following initial analysis of results by LL and CM, and contributed to the development of the article. Funding This article is based on independent research commissioned by the National Institute for Health Research (NIHR) under the Collaborations for Leadership in Applied Health Research and Care (CLAHRC) programme for North West London. JER and TW were also financially supported by Improvement Science Fellowships from The Health Foundation. Disclaimer The views expressed in this publication are those of the authors and not necessarily those of The Health Foundation, the NHS, the NIHR or the Department of Health.